We usually refrain from advertising repair services for boards well known for solely developing bad electrolytic capacitors for the simple reason that we believe in the human nature and the ability to do most simple things like replacing them without external help. Every now and then, though, I am reminded that what may seem very simple and easy to some may not be so easy and simple to others. Anyhow, while electrolytic capacitor replacement can be considered as easy as component level repair can be, there are some gotchas to watch for. One thing I've seen in the past is damaging the copper track on the back, front or inside the hole where the leg of the capacitor goes. On some boards there are tracks on both the top and the bottom of the hole and the hole's internal wall is also galvanized and uses as a normal electrical link between the top and the bottom track. Overheating the solder at the bottom and especially under-heating it and ripping out the capacitor would often tear off the galvanized internal layer and when a new capacitor is installed it may not have connection - and if it does it will definitely not be a reliable one - between the top and the bottom track. I have seen customers and even technicians send boards to us which are otherwise functional, but do not work because of a torn link between top and bottom layer when pulling out a component. 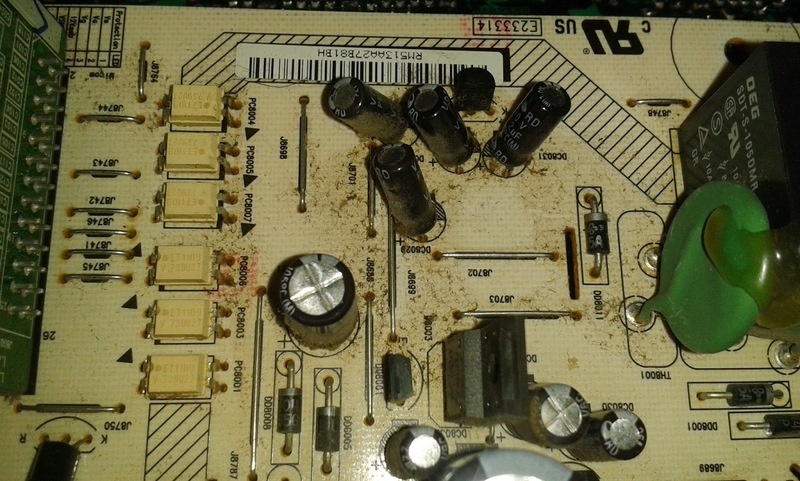 Of course this can happen with any other type of component, not just capacitors. 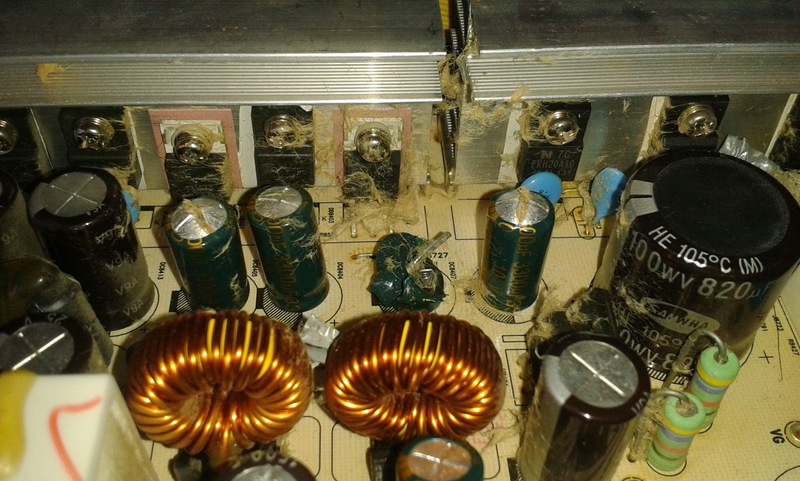 The board in this picture is PS-507-PHN / LJ92-01513A, but the same could happen with any other board where electrolytic capacitors are replaced with ones of lower breakdown voltage. The traditional way of blowing an electrolytic capacitor is to reverse its polarity, switching the positive and negative legs. It's very easy to do and sure enough even we do it sometimes. When put to work, the cap starts heating up quickly and the top swallows. 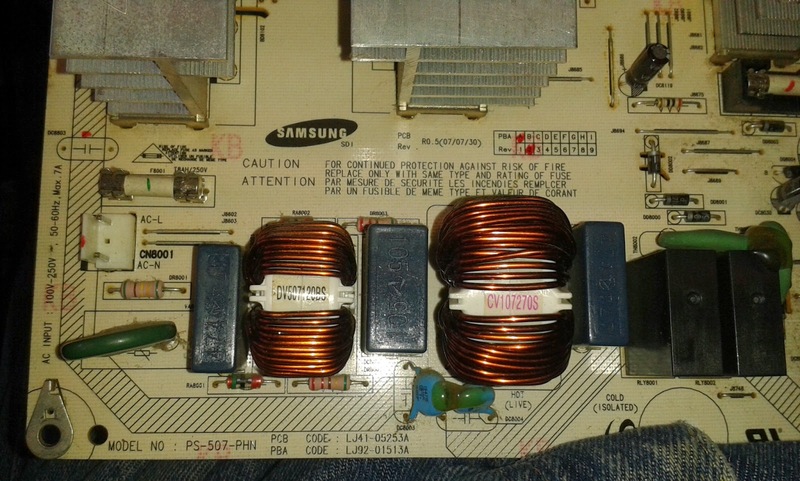 The capacitors on this board were properly aligned, though, but severely under-rated. Original ones were for 50V and they were replaced with ones for 16V. It must have been a loud and smoky explosion and as you can see this poor guy's internals are all over the place. This picture is just a reminder that when you pull out a board for service it is also in your own best interest to give it a little cleaning. 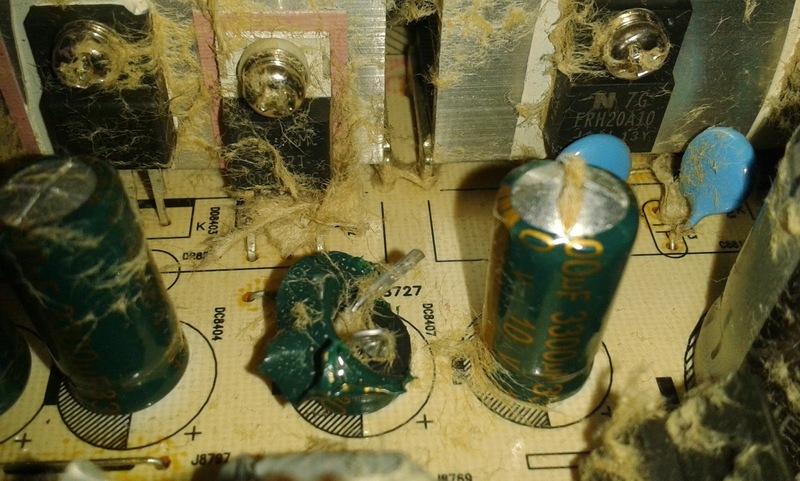 When the capacitor has exploded part of the foil from its outer body has wrapped itself around a nearby diode. This may actually result in a shortage and needs to be removed. Other than that and the mess exploded electrolytic capacitors are actually not much harm for the circuits. For those who privately or publicly doubt that I only write this blog to promote Coppell TV Repair offers and services: here is a post about something that will hardly ever turn into a commercial success yet is still both useful and fun! 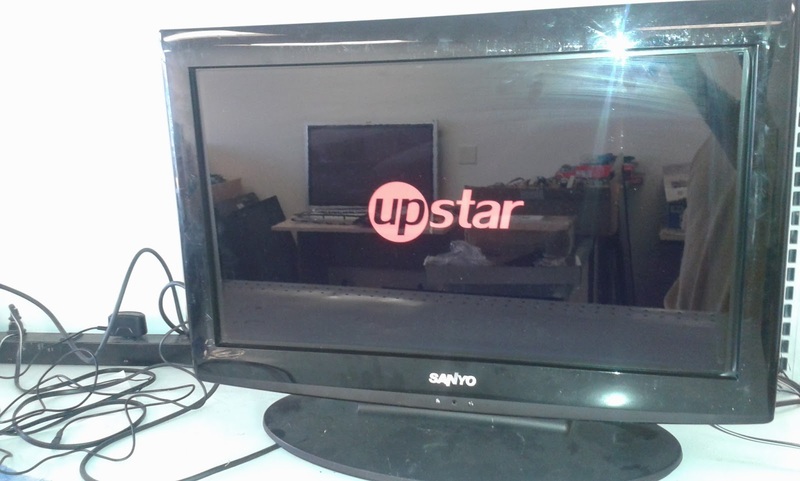 A customer brought in an Upstar P250WT LCD TV which, he said, was turning on, showing an Upstar red logo and then turning right back off. A nice sleek TV, which he said he liked (and we did too, once we saw it). We generally do not service anything below 32'' these days for it is cheaper to buy a new one (even though it'll likely last less than a properly repaired old unit), but we must have been high on that day and somehow took it in. 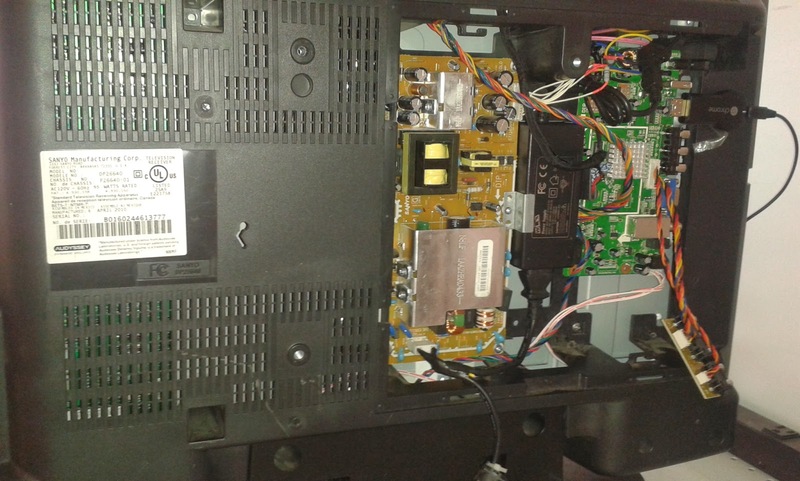 Our hope was that it was a typical bad power supply capacitor problem, but as we quickly found it wasn't: the power supply of that TV is external and the kind you hardly ever see developing such a problem. So we opened it up and started experimenting. Unfortunately we didn't take pictures at that point. We found that despite of its extremely low thickness the TV was actually with CCFL powered back light and not LED or DLED as we thought at first. The backlight inverter LCD220D-000A is on a separate small board, which is taking power (and , apparently activation signal) from the main board. 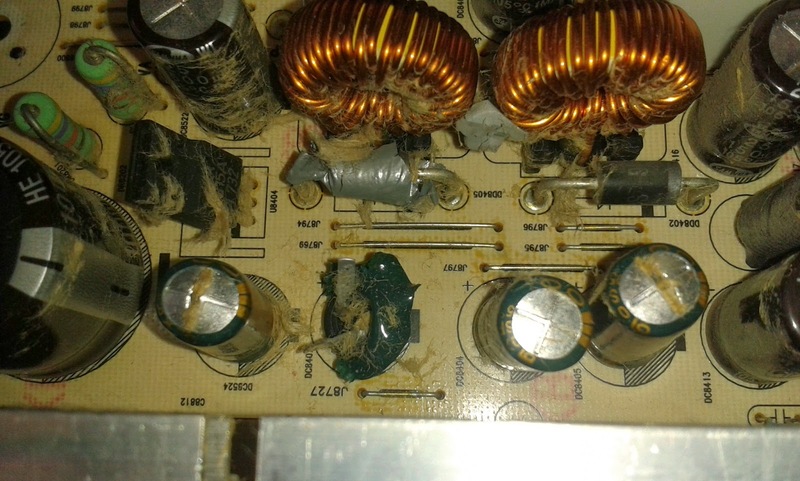 We saw traces of heat around one of the transformers and assumed that was the problem, but true to the advices we ourselves give to unhappy eBay customers ("read, do not assume!") we decided to run a few tests before searching for a new inverter board. First, the signals going to the inverter board are extremely simple: ground, 12V (power) and an activation signal telling the board to turn on. No feedback whatsoever. 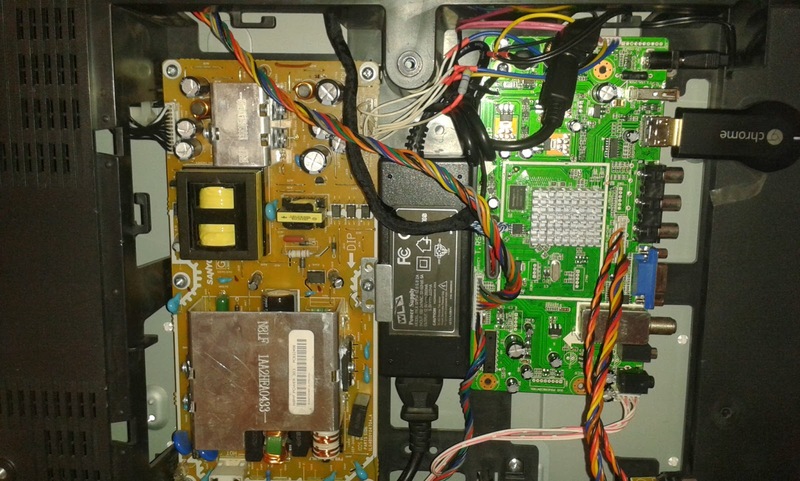 What that automatically means is that the TV should be able to come on and stay on (even without backlight) if the inverter is disconnected from the main board, thus preventing power overload in case of a problem. So we did the test and the TV did stay on, ruling out the possibility of a bad main board. We disconnected one of the two output sets of connectors and the effect was the same, with the display being just slightly more lit. When we tried the same with the other set of connectors the display did not lit at all. So it was either the CCFL or one side of the inverter that was causing the issue. Third, we pulled out the inverter board and swapped place of the output connectors (we can do that since the inverters in most LCD TVs don't know what exactly are they powering, let alone one in a cheap 25'' unit) and ran the same procedure. This allowed us to find that apparently BOTH sides of the inverter were igniting the lamps and that one of the lamps (or one circuit, we did not know until we opened the backlight assembly) was not working regardless of where it was connected. Voila, we knew where the problem was - a bad CCFL! We called customer and told them this is pretty much a lost cause and if they please want to come back and take the TV; he didn't respond and a few days we called again, still to no avail. Hope he's all good, but eventually we opened the TV to see if we could maybe eventually, hardly-yet-why-not-try-it, fix what's wrong and fix it. Long story short we ended up disassembling the backlight. CCLFs turned out to be extremely thin and there is only two pairs of them - one pair at the top of the display and one pair at the bottom. 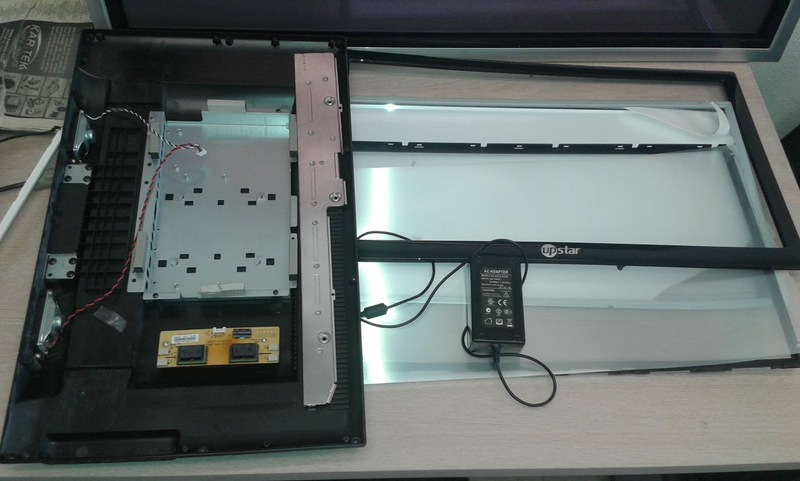 The display's backlight is a solid plastic with several sheets behind in order to disperse the light (sorry if I am using the wrong term...I was writing software in most classes at high school which were not related to math, current or computers and that included most sections of physics too). What ended up being at fault was one of the two pairs. Often times with classic CCFLs the problem is actually bad contact between the lamp and the wire/socket and that's often times solvable with nice cleaning and soldering (it is another story that it is not worth doing with today's TV prices). Here, though, we actually broke the pair of lamps before we could even attempt a repair. The other half we salvaged and will likely put at our eBay store, but I will make sure the listing warns of the high risk in attempting repair on those and it will be an AS-IS, no returns sale due to same said risks. While definitely doable if one takes the time and patience to do it, I do not think this is a commercially viable repair service and we will not be offering it. We ended up with a good display TV that was not quite repairable as lamps were nowhere to be found and installing them would have been a PITA anyway. The natural course should have been to just sell either the parts or the whole TV on eBay AS-IS, but we opted for something else. We took an old 26'' Sanyo with broken display and morphed the Upstar P250WT into it. In the past I've written an article about a similar Frankensteinism with a high-end Sony TV. 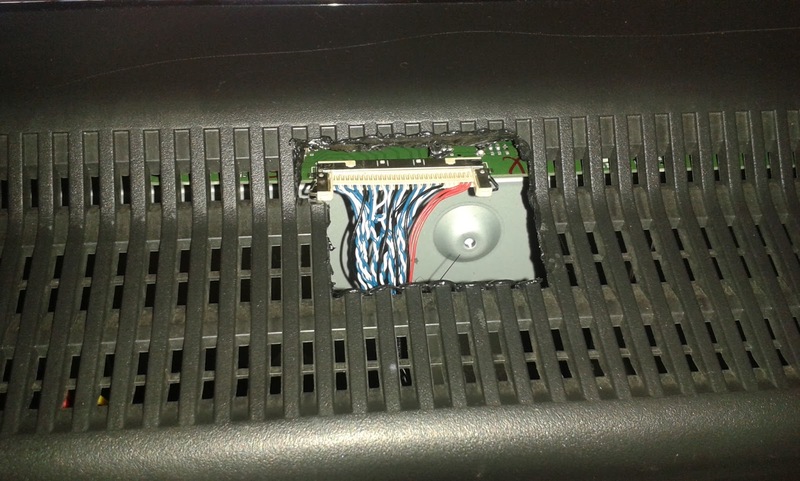 This time we had to take out the LCD panel out of the Upstar and put in the place of the broken panel from the Sanyo. They didn't quite match in size, but there are ways to get around that, including using black electrical insulation tape , so we did. 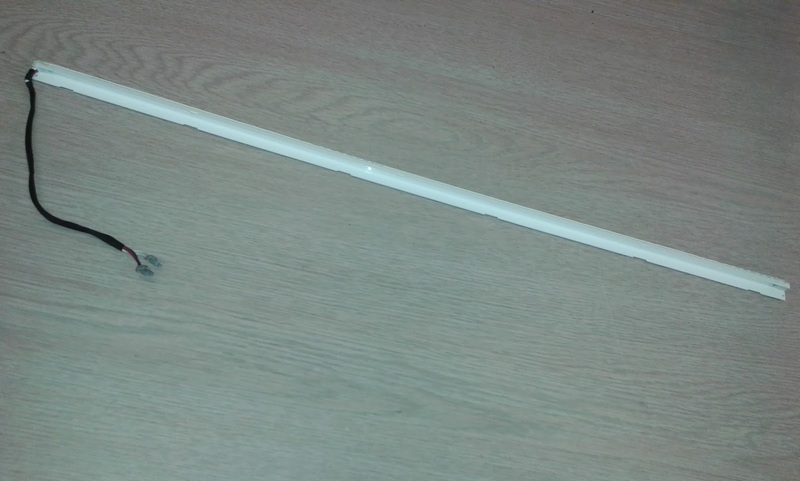 Not the most elegant or the most reliable approach, but definitely fast and - so far - working one. Then we had to do a little research on the main boards, some patching etc. stuff you don't really care for. The outcome, in a few pictures, is shown below. I would say it is not worth the time from a commercial standpoint, but if you've given up writing software (even if for a while - 4-5 years perhaps) it is totally worth the fun.